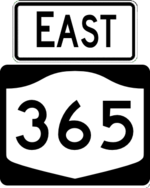 NY 49 ends on the Utica-Rome Expressway, a freeway running from Rome to I-790 in Utica. It runs parallel to the Thruway for the last couple miles and NYSDOT is interested in extending the I-790 designation to Rome (but needs to eliminate the at-grade railroad crossing first). 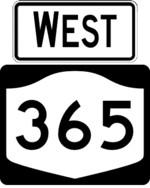 The initial section built was between NY 825 and NY 291 in response to high traffic volume and accidents on the old route. It was extended west to downtown Rome in the 80s and finally east to I-790 in 2003. 50.0 Lawrence Street Westbound traffic exiting merges onto eastbound NY 49 and exits there.